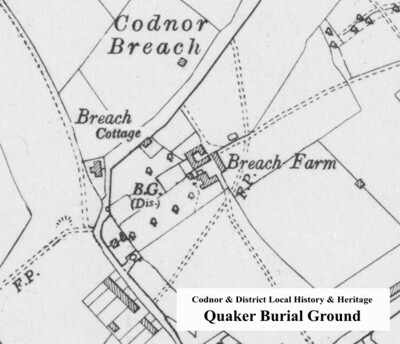 The Society of Friends established a Quaker meeting house and burial ground at Codnor Breach in 1675. It was located at the side of Breach Farm and behind Breach Cottage at the top of Codnor Denby lane. It is thought that early meetings were held in one of the farm buildings until a dedicated brick building was erected a while later. Fig.1 Map dated 1938 showing location of Quaker burial ground marked B.G. (Disused) near the middle of the map. Births, Marriages and Burials took place at this meeting place between the years 1675 and 1834. It is said the meetinghouse suffered damage due to mining subsidence and was demolished. ‘Friends having built a new meeting house at Heanor and sold the old one at Breach to be pulled down, but have reserved the burial ground’ 25th March 1835. Today the burial ground is preserved but hidden behind modern housing developments, no grave markers exist. I have transcribed details of 165 burials at Codnor Breach from the Quaker registers listed at the bottom of this page. Older Quaker records did not use the names of the month but instead used the month number. Also prior to 1752 the Quaker year began in March so this was the 1st month of the year and the following February was the 12th month. Later if an event took place at the beginning of the year it was often recorded using both the Quaker and Gregorian calendar to prevent any confusion. For example the date 8th February 1748 would be written 8th day 12th Month 1748/9. Click the Button to view a list of Quaker burials at Codnor Breach. Information for this page was obtained from the following sources.